Epson Transforms Printer Category with EcoTank – Loaded and Ready to Print for Up to Two Years Without an Ink Refill -- New “Supertank” Category of Printers Features Large Ink Reservoirs Setting New Standards of Convenience and Value for Color Printing. Epson is transforming the $40 billion North American printing market¹, addressing one of the biggest pain points for small businesses and consumers: running out of ink. 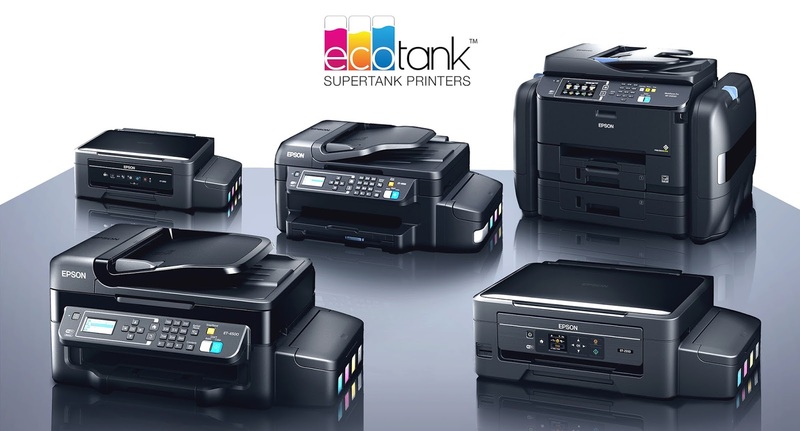 Under its new EcoTank™ brand, Epson today unveiled five new all-in-one color printers featuring large ink reservoirs – what Epson defines as the Supertank category – that come loaded and ready for up to two years of prints without replacing the ink². EcoTank color printers combine the high-quality printers Epson is known for with dramatic in-box cost savings and ultra-low ink replacement costs. In addition, EcoTank printers eliminate the common frustration of running out of ink at inevitably the most inopportune time. Less ink refills also means less waste. When comparing EcoTank to a traditional printer, the ink included with the EcoTank is equivalent to about 20 sets of ink cartridges³ or more, depending on the model. About 90 percent of the pages printed in the United States are printed in black-and-white, not color4. Two-thirds of those pages could be in color. Previously, a major barrier to color printing has been the cost of ink replacements. EcoTank printers are loaded and ready with up to two years of ink² – and when replacement ink is needed, the cost will be as low as $12.99 per bottle, or $52 per set of bottles. For example, a standard home printer requires approximately 20 sets of cartridges to print the same number of pages included with the equivalent EcoTank printer³. EcoTank printers are part of the Supertank category, and combine the latest in advanced MicroPiezo® printhead technology with a large ink reservoir to create an entirely new printing system. EcoTank is available in five models for the home and small-to-medium business, offer a two-year limited warranty with registration5 have built-in wireless for easy printing from tablets and smartphones6 across a range of operating systems, as well as through Epson Connect™ solutions. WorkForce® Pro WF-R4640 EcoTank All-in-One, powered by PrecisionCore® – for the small business, with an in-box ink yield of up to 20,000 black and 20,000 color pages7 and print speeds of up to 20 ISO ppm (black) and 20 ISO ppm (color)†. The WF-R4640 delivers Performance Beyond Laser™, producing print-shop quality prints with up to 70 percent lower total printing costs vs. color laser8. It features a 580-sheet capacity, auto 2-sided printing, copying, scanning and faxing and a 4.3” color LCD. WorkForce ET-4550 EcoTank All-in-One, powered by PrecisionCore – for the home office, with an in-box ink yield of up to 11,000 black and 8,500 color pages9, high-speed, laser-quality black text, and print speeds of up to 13 ISO ppm (black) and 7.3 ISO ppm (color)†. The ET-4550 features 2.2” LCD, auto 2-sided printing, a 30-page Auto Document Feeder, and a 150-sheet paper capacity. WorkForce ET-4500 EcoTank All-in-One – for the home office, with an in-box ink yield of up to 4,000 black and 6,500 color pages9 and print speeds of up to 9.2 ISO ppm (black) and 4.5 ISO ppm (color)†. The ET-4500 features a 30-page Auto Document Feeder, a 100-sheet paper capacity and a 2.2” LCD. It also includes built-in Wi-Fi Direct®10, and easy printing from iPad®, iPhone®, tablets and smartphones6. Expression® ET-2550 EcoTank All-in-One – for the home, with an in-box ink yield of up to 4,000 black and 6,500 color pages9 and print speeds of up to 9.2 ISO ppm (black) and 4.5 ISO ppm (color)†. The ET-2550 features a 1.44” color LCD, PC-free photo printing with a built-in memory card slot11, and a 100-sheet paper capacity. It also includes built-in Wi-Fi Direct10, and easy printing from iPad, iPhone, tablets and smartphones6. Expression ET-2500 EcoTank All-in-One – for the home, with an in-box ink yield of up to 4,000 black and 6,500 color pages9 and print speeds of up to 9.2 ISO ppm (black) and 4.5 ISO ppm (color)†. The ET-2500 offers easy one-touch copying to get high-quality copies fast, and a 100-sheet paper capacity. The Epson Expression ET-2500 EcoTank ($379 MSRP), Expression ET-2550 EcoTank ($399 MSRP), WorkForce ET-4500 EcoTank ($429 MSRP), WorkForce ET-4550 EcoTank ($499 MSRP) powered by PrecisionCore, and the WorkForce Pro WF-R4640 EcoTank ($1,199 MSRP) powered by PrecisionCore will be available September 2015 through major computer, office and electronic superstores, mail order, including Staples, Best Buy, Office Depot, Amazon, Microcenter, Costco.com, Samsclub.com, Target.com, Walmart.com and www.epsonstore.com. For more information and availability, please visit epson.com/ecotank. 0 comments on "Epson's five new all-in-one color printers featuring large ink reservoirs unveiled"